North Carolina Governor Roy Cooper said at a news conference on Friday evening that “several more deaths are under investigation”. Medical examiners at the local and state level will determine whether deaths are storm-related. The storm’s third fatality claimed a person who was killed while plugging in a generator in Lenoir County, according to the governor’s office. North Carolina Governor Roy Cooper told a news conference that whole communities “could be wiped away” by the 400-mile-wide hurricane. “It’s an uninvited brute who doesn’t want to leave,” he said. The state’s transportation secretary, James Trogdon, said it may see flooding that normally only occurs once every 1,000 years. Parts of North Carolina have seen storm surges as high as 10ft (3m). Thousands of miles away a powerful storm has reached the Philippines. More than five million people are in the path of Super Typhoon Mangkhut, officials say. By early afternoon on Friday Florence’s winds had weakened to 75mph, and it was expected to gradually weaken further over the weekend. But US officials say it remains extremely dangerous because of potential catastrophic flooding. The North Carolina governor said the hurricane was likely to “continue its violent grind across the state for days” as it crawls along at just 5mph. Forecasters say the storm surge, together with up to 3.5ft (1m) of rain over the next few days, could spawn a slow-motion disaster. 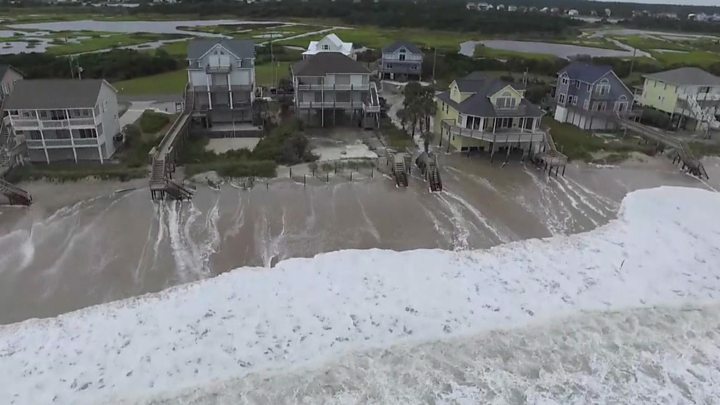 Florence is forecast to dump about 18 trillion gallons of rainwater on US soil, most of it in North Carolina, meteorologist Ryan Maue tweeted. Hurricane Harvey last year shed 33 trillion gallons of rainwater in the US. Nearly 620,000 homes and businesses are without power; energy companies say up to three million homes and businesses could lose electricity. Officials have estimated that restoring electricity could take days or even weeks. 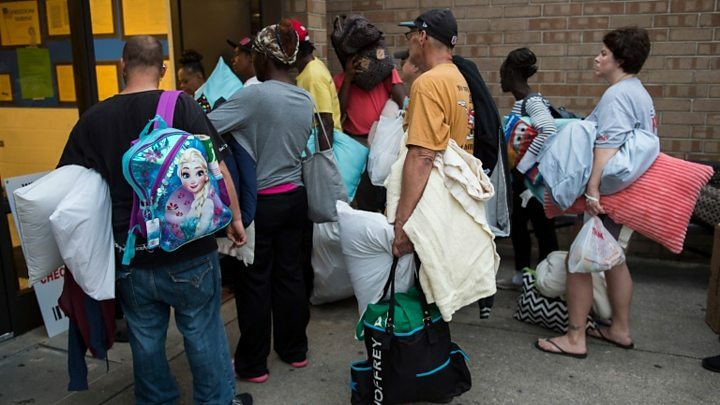 In Jacksonville, North Carolina, officials rescued more than 60 people overnight from a hotel that was collapsing in the storm. Emergency workers arrived to find the Triangle Motor Inn’s structure crumbling, with many guests still in their rooms. Parts of New Bern, North Carolina, which is home to 30,000 people, were 10ft underwater. At least 200 householders in the riverfront city had to be plucked to safety by authorities. Local resident Peggy Perry told CNN she was “stuck in the attic” along with three relatives. 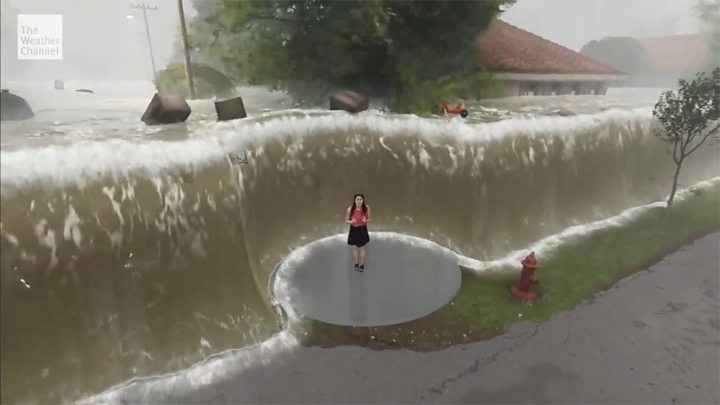 “In a matter of seconds, my house was flooded up to the waist, and now it is to the chest,” she added. Officials have warned people against entering attics, so as to avoid drowning, unless they have a means to cut through to the roof. Tom Balance, owner of a seafood restaurant in New Bern, decided not to evacuate and had to be rescued by police. “I feel like the dumbest human being who ever walked the face of the earth,” he told AP news agency. More than 20,000 people have been taking refuge in emergency shelters. At the White House, President Donald Trump has been retweeting local emergency officials’ updates and tips for surviving the storm.